Oregon’s Department of Fish & Wildlife announced Tuesday that last weekend’s highly popular sturgeon “retention” season will close, effective immediately, on the lower Willamette River downstream from Willamette Falls, including the Multnomah Channel and the Gilbert River. This scuttles what fishery managers originally announced in January, a four-day retention season to include Feb. 17-18 and Feb. 24-25. After a two month hiatus in August and September, the Columbia River is open once again for retention of white sturgeon between the Wauna Powerlines and Bonneville Dam. 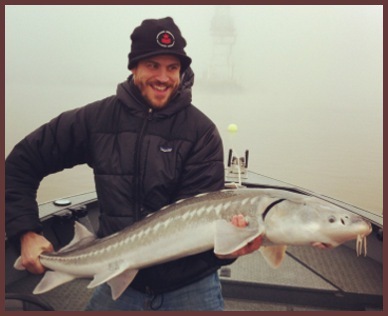 Legal size “keeper” sturgeon between 38 and 54 inches long are available to catch and bring home for the table on Thursdays, Fridays, and Saturdays. The season is slated to run from October 1st through December 31st (or until the harvest guideline of approximately 11,300 fish is met). 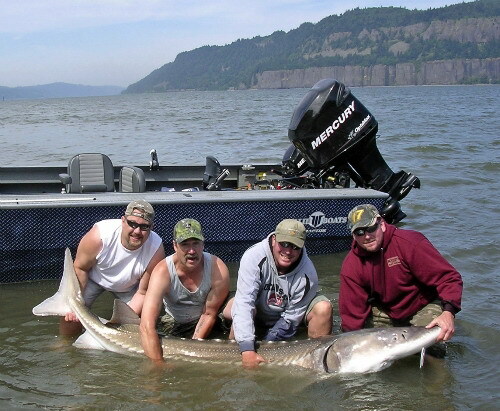 Columbia River anglers looking to cool off this summer are finding the world class oversize sturgeon fishery below Bonneville Dam red-hot this time of year. Tales of behemoth sturgeon over 20′ long and over 1,500 pounds have circulated throughout the Gorge for years. You are currently browsing the archives for the Sturgeon Fishing category.